Behind the scenes. Behind the screen but in front of it too. Who are you ? At what point did you join the journey ? "Dedales" ? "Pere Noel" ? "The Passage" ? Have a great cyber-trip behind the screen. In addition to each section, set out for each film, we have prepared two "special" for you. The lengthly interview from Lucasfilm Magazine about René’s work on "YOUNG INDY"
News on René’s world ? 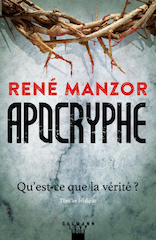 His new novel "APOCRYPHE" was released by Calmann-Levy on October 3rd, 2018. Also available as an ibook through Les Editions de l’épée. For more info, click on "NewsDesk" then on "News". Send us your comments, suggestions and e-mails to make this site our site. But, please, no attached files so as not to jam the mailbox. If you wish to send us documents, we’ll give you another address.